Gas Company Understated Benzene Exposure From California Leak : The Two-Way SoCalGas wrote about two air samples with high levels of the carcinogen — but not about 12 others, the AP reports. And the LA Times writes that efforts to cap the well appear to have destabilized it. This photo taken Nov. 3, 2015, shows SoCalGas crews and technical experts attempting to safely stop the flow of natural gas leaking from a storage well at the utility's Aliso Canyon facility in Los Angeles. 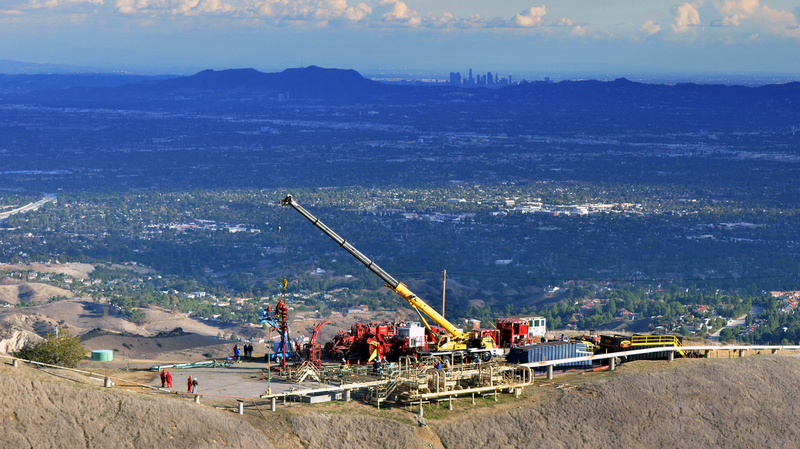 Efforts to plug the well appear to have destabilized it, the Los Angeles Times reports. The company that owns the leaking natural gas well in Los Angeles understated the number of air samples showing higher-than-usual levels of benzene, The Associated Press reports. Adding to concerns over the disaster, efforts to stop the leak appear to have destabilized the well, the Los Angeles Times reports, raising the risk of a blowout. The leak at Porter Ranch, which recently prompted California to declare a state of emergency, has been spewing enormous quantities of the greenhouse gas methane into the air for months. It's expected to take months more to fix. The disaster has been compared to the BP oil spill for its impact. The company that owns the leaking well, Southern California Gas Co., has been under fire for not quickly communicating to nearby residents when the leak (which is invisible to the naked eye) began. Now the AP says the utility has also been less than transparent about the results of its air tests. SoCalGas "understated the number of times airborne levels of the cancer-causing chemical benzene have spiked during the crisis," the wire service reports. Twice-daily air sample results have been posted online by the company. Summarizing the results, the company said benzene — which is known to cause leukemia and anemia — was detected at "extremely low concentrations ... consistent with the levels expected for the area." The South Coast Air Quality Management District's most recent report on air pollution notes that average levels of benzene across the LA area are less than 0.5 parts per billion. But the company puts "levels expected for the area" at up to 2 ppb. "Apparently relying on that standard, SoCalGas originally said that benzene was found in amounts slightly higher than background levels in just two samples, both on Nov. 10. The suspect readings were 5.6 parts per billion in one gated development about a mile from the well and 3.7 parts per billion in the Porter Ranch Estates neighborhood of 1,100 homes. "However, a more detailed look at the data by the AP and outside experts showed at least 10 other instances over seven days in November when benzene exceeded 1 part per billion. "In its update Thursday, SoCalGas said that nearly 1,200 tests had found 14 instances where benzene exceeded 1 part per billion, including one time in December." A SoCalGas spokeswoman called the omission of those readings from the summaries "an oversight," the AP says. The company maintains there's no health risk posed by the leak. So how much benzene threatens human health? It depends on whom you ask. SoCalGas points to the OSHA standard for acceptable workplace exposure, which is 1,000 ppb over an eight-hour period. California's EPA has defined stricter levels for benzene: 8 ppb for acute exposure (one hour) and 1 ppb for eight-hour or chronic exposure. The World Health Organization maintains there is no safe concentration of benzene. Meanwhile, the Los Angeles Times reports that SoCalGas' efforts to cap the well have actually increased the risk of a blowout. "The chief deputy director of the [California Department of Conservation], Jason Marshall, and a senior oil and gas field regulator assigned to daily watch at Aliso Canyon, Scott McGurk, told The Times the site and wellhead were made more unstable by the gas company's attempts to stop the leak by pumping a slurry directly into the well. "The last of those efforts, which stretched over several days beginning Dec. 22, expanded a crater around the wellhead, state and gas company officials said.
" 'If the wellhead fails, the thing is just going to be full blast,' said Gene Nelson, a physical sciences professor at Cuesta College. "It will be a horrible, horrible problem. The leak rates would go way up.' "
The newspaper also notes that even without a blowout, the leak could catch on fire. It quoted California Department of Conservation spokesman Don Drysdale as saying the possibility is "a concern." You can read the Times' full report.